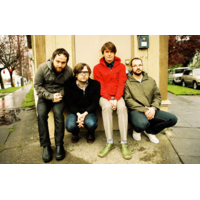 Death Cab for Cutie is an American indie rock band formed in Bellingham, Washington in 1997. The band consists of Ben Gibbard (vocals, guitar), Chris Walla (guitar, production), Nick Harmer (bass) and Jason McGerr (drums). Gibbard took the band name from the title of the song written by Neil Innes and Vivian Stanshall and performed by their group, the Bonzo Dog Doo-Dah Band, in The Beatles' 1967 film, Magical Mystery Tour. The song's name was in turn taken from a pulp fiction crime magazine. Gibbard's first album, You Can Play These Songs with Chords, was released as a demo, leading to a record deal with Barsuk Records. It was at this time that Gibbard decided to expand the project into a complete band, and recruited band members to join. The band has released six studio albums, five EPs, and one demo to date. Their most recent album, Narrow Stairs, was released in May 2008. The band will be releasing their next album, Codes and Keys, in Spring 2011.